A nationwide movement to enshrine “abortion rights” into state laws is coming to Virginia. The Virginia General Assembly saw a bill filed this year similar to that of New York’s recent abortion legislation. HB 2491 (Delegate Tran) would have eliminated the requirement that second trimester abortions be performed in a hospital; eliminated most of the procedures and processes, including the performance of an ultrasound, required to obtain a woman's informed written consent before an abortion; eliminated the requirement that two other physicians certify that a third trimester abortion is necessary to prevent the woman's death or impairment of her mental or physical health; eliminated the need to find a substantial and irremediable health impairment in order to obtain an abortion anytime in the third trimester; thereby requiring only one physician to certify that the continuation of the woman’s pregnancy would likely impair her mental or physical health in order to obtain a third trimester abortion up until the birth of the child (40 weeks); and eliminated regulations establishing minimum health and safety standards for abortion facilities. A similar bill SB 1451 (Senator McClellan) was also filed in the Senate. Fortunately, through our advocacy along with other pro-life groups in Virginia both bills failed on a party line vote 5-3 and 8-7. The Governor’s administration spoke in support of HB 2491, and we anticipate seeing similar bills filed next year. This year Virginia also saw another unprecedented bill (SB 1637, Boysko) similar to that seen in New York, which sought to add the “right to reproductive choice” aka “right to abortion” into the Virginia Human Rights Act. The bill would have expressly made access to abortion, contraception and sterilization a “fundamental right” in our state law, in direct contradiction to the fundamental right to life. The Governor’s administration also spoke in support of this bill. “The administration does strongly support this bill,” said the Deputy Secretary of Health and Human Resources. “We see this not just as a women’s issue but an economic justice issue; and one that promotes having access to reproductive healthcare, comprehensive reproductive health care, is one that is deeply connected to promoting strong families.” Fortunately, this measure was also defeated in an 8-7 party line vote. We and other pro-life organizations were instrumental in stopping this bill as well. Moreover, many of you are aware of the Equal Right Amendment movement that has come to Virginia, seeking to make it the 38th state to “ratify” the now moot ERA into the federal Constitution. We have opposed these efforts as there is no denying the ERA poses a threat to the unborn. Last week, Planned Parenthood and other groups filed a lawsuit arguing that the Pennsylvania Constitution’s ERA language, which is consistent with the federal ERA, must be construed to require taxpayer funding of abortion through Medicaid. The suit also requests that the court “declare that abortion is a fundamental right under the Pennsylvania Constitution.” Fortunately, after a full hearing, a House Privileges and Elections subcommittee voted 4-2 last week not to pass the ERA (HJ 577, Rasoul; HJ 579, Carroll Foy; HJ 583, Ward; SJ 284, Sturtevant). Procedural efforts to revive the ERA continue in Virginia and we will continue to fight these efforts. Last but certainly not least, the Virginia General Assembly has seen an influx in the past two years of health plan mandate laws that would force private employers to provide insurance coverage for abortions, contraceptives, abortifacients and sterilizations. We are still fighting these mandate bills this session. Tomorrow morning, the Senate Commerce and Labor Committee will consider four measures (SB 1132, SB 1185, SB 1287 & SB 1344) that when combined would require health plans to cover abortions, abortion-inducing drugs, sterilizations, contraceptives and gender transition procedures. By doing so, they would violate the rights of conscience of religious employers and others with moral or religious objections to these procedures. We will be fighting these bills tomorrow and thank you to those who will be standing alongside us. As Virginia is increasingly facing more threats to the unborn and conscience rights through aggressive legislation, we are going to need your help to stand against these measures. Please spread the word and get involved! 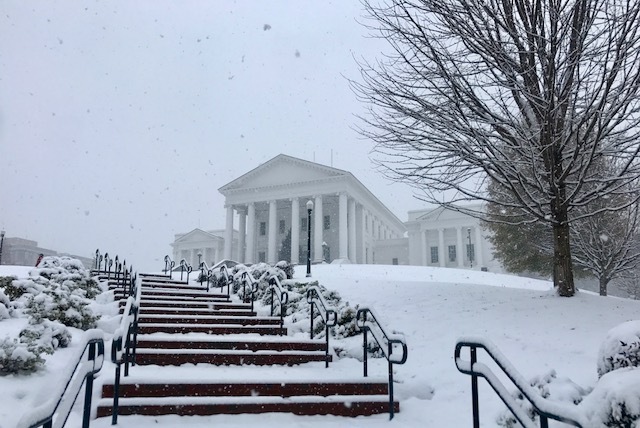 There will be many ways you can become involved in the coming year as the 2020 Virginia General Assembly session approaches. Your voice matters! Please urge people to visit www.vacatholic.org and sign up for our advocacy network.